To kick start the rain season, I decided to dig into my candy cap reserve and bake some cookies for my mushroom cultivation class. Most of the students are beginners in mycology and never had candy caps or candy cap cookies. I figured this would be a good way to get them excited. I was super excited when I first learned of this amazing little dessert mushroom! 1. Cap and stalk burnt orange to orange-brown or sometimes reddish-brown. 2. Cap small (usually <2 1/2" broad), the surface dull and dry. 3. Fresh gills exuding a watery white milk when cut. 4. Neither the milk nor the flesh change color when exposed. 5. Entire mushroom brittle, the stalk snapping open cleanly like a piece of chalk. 6. No veil, ring, or volva. 7. Odor sweet (like maple syrup), especially when cooked or dried. You may also find candy caps in mushroom specialty stores like Far West Fungi. I picked an abundant amount of candy caps in January this year. I dried all of them since their maple syrupy aroma gets stronger after they are dried. They are excellent in cookies, breads, waffles, pancakes, cheesecakes, pancakes, and ice cream. This Candy Cap Cookies recipe is in David Aurora's All That the Rain Promises and More... I have made it several times and have some tips to ensure your success in making these cookies. Rehydrate the mushrooms by soaking them in lukewarm water for 15 minutes. Chop up the mushrooms into tiny pieces and saute them in a little butter. Set aside. Cream together 1 cup butter and 1 cup sugar. Beat in 1 egg and, if you like, add 1/2 tsp vanilla extract. Stir in 2 1/2 cups of flour in small batches. I add 1/2 cup at a time into the mixer and let it mix well before adding the next 1/2 cup. It's very important that you don't dump all 2 1/2 cups at once. If you do that, the dough will fall apart. After the flour is all mixed in, you can stir in some finely chopped nuts. I usually add some pecans. Stir in the mushroom bits and mix it well. Form the dough into rolls about 1 to 1 1/2" in diameter. I personally prefer not to get the dough all over my hands because I don't want to waste any dough if possible. I use a bamboo sushi roller to roll up the dough in a sheet of wax paper - just like how you make a roll of sushi. Use the wax paper as if it was a sheet of seaweed, put it on top of the bamboo roller, scoop up a desirable amount of dough and spread it out across the paper with a spatula. The roller is a handy tool in rolling up the cookie dough without it melting in your warm hands. The bamboo roller is available in Asian markets for about $2. Fold down the ends of the wax paper and freeze. When ready to bake, remove rolls from freezer and slice them to no more than 1/4 inch a piece. Place them on ungreased cookie sheets. Bake at 350 degrees for 8-10 minutes or until very lightly browned around the edges. Makes about 6 dozens. There is nothing else that smells like these cookies. I love surprising people with them and look at their puzzled faces as they try to figure out what makes the cookies so good. The surprised expressions on their faces after learning it's a mushroom is simply priceless. I just learned about Kombucha back in January this year. "Kombucha" was mentioned a lot in Master Ken's class. I looked it up on Wikipedia, and it looked a bit scary to be honest. That thing they call "mother" or "Kombucha mother" in a glass jar is quite alien looking. Some people call it "mushroom." I can tell you that it is NOT a mushroom. It's actually a "Scoby" - Symbiotic Colony of Bacteria and Yeast. Does that sound any better? Not really. When Lisa, who was in my class, heard that I never had Kombucha tea, she told me that she's been brewing and drinking Kombucha regularly. She said she'd be happy to bring some for me to try. She told me that I could also get them in grocery stores. A few days later, I saw an article about Lindsey Lohan's favorite Kombucha drink, Synergy. My curiosity level was getting higher by the day. Finally, I picked up a bottle of guava flavored Synergy Kombucha for $4 while in San Francisco. It tasted nothing like Guava. It was just pure almost unbearable sourness (and I can take a lot of sour!). I gave up on drinking it after 4 sips. Lisa (center) hosts a kombucha tasting at Summer Garden Fair at Golden Gate Park, 2010. Lisa and several others brought their Kombucha tea to our Fermentation Club that meets once a month. I was skeptical. I tried Phil's Kombucha, and it was very sour. I tried Jenny's Kombucha, and it was not as sour. It was almost good. I tried Lisa's Kombucha, and I wanted more! It had the perfect balance of sour, sweet, and tangy. It turned out that Phil's Kombucha was brewed too long; hence, it basically turned into vinegar. Jenny's tea was brewed a bit longer than it needed to. Lisa, who's been experimenting longer than others, figured out the small window when the tea is just perfect. She would then pour the tea out from the "Mother" jar so it would not keep fermenting; furthermore, she mixes different herbs and spices, fruit juice, vegetable juice, etc., to create unique flavors. So why drink Kombucha? Many people in my Fermentation Club strongly believe in the health benefits of Kombucha. Common claims are that Kombucha aids cancer recovery, increases energy, sharpens eyesight, aids joint recovery, improves skin elasticity, and aids digestion. After tasted Lisa's Kombucha, I have been drinking it just because it tastes good. I have never been too crazy for carbonated soda water. Why drink soda? It's bubbly and high in sugar. I don't think anyone can claim any health benefit of soda water. When I drink Lisa's Kombucha, I feel a bit more energetic. And how can you resist these flavors - Ginger Aid, Strawberry Bliss, Sangria Fiesta, Orange Julius, Key Lime Pie, Old Fashioned Root Beer, Grape Soda, Berry Blast, etc., etc. Lisa's been very generous with free tasting of her tea. Her husband, Joe, is just as enthusiastic as she. He makes sure that you get to try every flavor. Master Ken and others have been giving her a lot of feedback on the taste and ideas on what herbs she might be able to try. When Joe announced to everyone that Lisa's Ginger Aid Kombucha won first place at Eat Real contest this year, I couldn't be happier for her! I knew then that I wasn't being biased about how good it is. Lisa of course is too modest to toot her own horn, so I will do that for her. If you are in the Bay Area and curious about Lisa's Kombucha, send her an email at LisaLeonard1@ymail.com to get on her email list for updates. Give something new a try, you may be in for a surprisingly pleasant experience. "Extreme Gardening!" was what my next door neighbor said to me when he saw me digging soil and pulling weeds in the dark. Well, at least I am not doing it in down pour rain. Now that would be a real challenge. Before I left for New York last month, I started some daikon and green onion seeds in the campus greenhouse. I brought them back on Sunday but haven't had much daylight hours to plant them in the veggie beds. As it was getting dark tonight, I hurriedly pulled out partially dried up tomato plants and filled the bed with compost from El Cerrito Recycling Center. I planted just a few daikon seedlings on one side of the bed before it became completely dark out, and I was finally overcame with hunger. I have also planted a bunch of green onion seedlings in the potato and onion bed. I dug up some potatoes and onions to make room for the green onions. Since they came right out of the veggie patch, they were covered with my primo soil. I wouldn't want to rinse the soil down the kitchen drain, so I washed all fresh produce outside in a bucket then poured the water right back into the veggie beds or potted herbs. The rain is supposed to start again on Thursday afternoon through the weekend. It looks like tomorrow night is another "extreme gardening" night. We Bay Area people are all about fusions. Most of time, I try to make ethnic dishes as authentic as I possibly can, but there are times availability wins. I have always loved hot and sour soup. It's spicy and sour, two of my favorite flavors next to sweet. I have been making hot and sour soup since I was a teenager, so a recipe has become obsolete long ago. I cut up a piece of soft tofu, opened up a can of bamboo shoots, and chopped up some fresh green onion from the farm. I thought it would be really nice to have some mushrooms. Normally, wood ear mushrooms are what you put in hot and sour soup. Shiitake mushrooms are good substitutes since they are Asian mushrooms. Well, I don't have any wood ear or Shiitake. 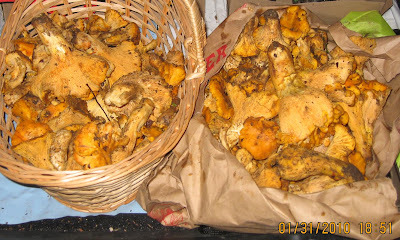 I looked into my pantry - I have a jar of dried candy cap mushrooms and a jar of dried golden chantrelle. I dried all of them earlier this year so I could have some during off season. Considering rain season has started, I didn't have to hang on to the dried mushrooms for special occasions. I opened up the jar of chantrelle and took a deep breath. Ahhhhhhhh....so good. I grabbed a handful and dumped them into the hot soup. I can really taste the chantrelle in the soup. At the same time, it is still very much hot and sour soup. I can eat that entire pot tonight. Below is the "rough" recipe for your reference, but you should always tweak it to your liking and according to availability of ingredients. Boil 4-5 cups of water (or chicken stock) and put the tofu in it. Put in the chicken bouillon if you are using one. Put in the bamboo shoots, mushrooms, chili flakes, vinegar (2 table spoons to start and add more if you like it more sour). Add soy sauce or salt if you are not using chicken bouillon. Bring it to boil. In the meantime, beat the egg in a bowl and add a couple drops of sesame oil while beating it. Dissolve the corn starch in some water. As soon as the soup is boiling, pour the corn starch solution in it, stir, and lower the heat. The soup should thicken. If you like it thicker, make more corn starch solution to add. Once it reaches the consistency you like, turn off the heat and pour in the egg. The beaten egg should float to the top as it cooks in the hot soup. Sprinkle the green onion on top and add a few drops of sesame oil. Do you see the deer in the picture? Today marked the first day of full rain for the mushroom season. We stayed inside for most of the class time since it will take 7-10 days for "good edibles" to grow and pop out of the ground. Around 2 P.M. we got the news that a couple young deer have wandered into the herb garden through an unclosed gate. Master Ken immediately asked the class whether anyone wanted venison as a joke. Gotta love his Texan humor. We got the task of chasing out the deer. Don't worry, there are plenty of other vegetation they can eat around the campus. We just can't have them eat up what the students have grown for their classes. After the class, a group of us put on our rain gear and went to searching for the deer. I spotted them along with a couple other guys. I even managed to snap a photo in the misty weather. They ran out of the horticulture garden soon after. This wasn't the first time we have seen deer inside of the herb garden. They always run away as fast as they can from people. I don't understand why that Oakland Police thought that young deer was a threat and had to shoot it numerous times. As I got back to my neighborhood driving down Central Avenue, I was surprised of what I saw on the street. Well, I was pretty sure that I saw turkeys. I pulled over, parked the car, and went looking for the turkeys with my camera. They were huge! Several cars slowed down when they saw the huge turkeys taking a walk just a block from El Cerrito Plaza. I wonder where they were going and what were going to happen to them. 3 wild turkeys travel down the street near El Cerrito Plaza. After the turkey encounter, I went home and started rearranging the mushroom blocks I got from Far West Fungi. Some of the shiitake blocks got moldy because I didn't have the time during the week to properly store them. The oyster mushroom blocks look pretty good so far with good potential. I spotted this newt(?) as I lifted up a piece of cardboard that was covering the spot where the juniper used to be. These caterpillars are regulars on fennel. The squirrel came back for more figs. I was able to get a few pictures of him. A couple days ago, a friend of mine in the office brought in a large bag of home grown Fuji apples to give away. She started describing to me this Filipino dessert which uses chopped up apples, roll them in lumpia wrappers and deep fry them. Basically, they are apple lumpia. Normally, I make apple pies, but her recipe sounded much easier and also delicious. You just can't go wrong with the combination of fresh home grown apples and deep frying. I told her that I could make some. Her eyes widened, "Really? And you are going to bring them tomorrow, right? Take all the apples!" As I bite into the crunchy shell, I was reminded of McDonald's apple pies although these rolls are nowhere nearly as sweet as McD's apple pies. The apple bits stay crunchy since they were fresh apples and only fried for less than 2 minutes. It is unfortunate that Oakland gets a lot of bad rap for its crime and negative images of police. If you are not from this area, you probably don't realize that Oakland has many parks up in the hills and next to the bay. It has a zoo and several community colleges. It is culturally diverse with large populations of Chinese, Hispanics, blacks, and white. There is a Chinatown where Bruce Lee lived at one point. You can find plenty of authentic ethnic restaurants there at bargain prices. 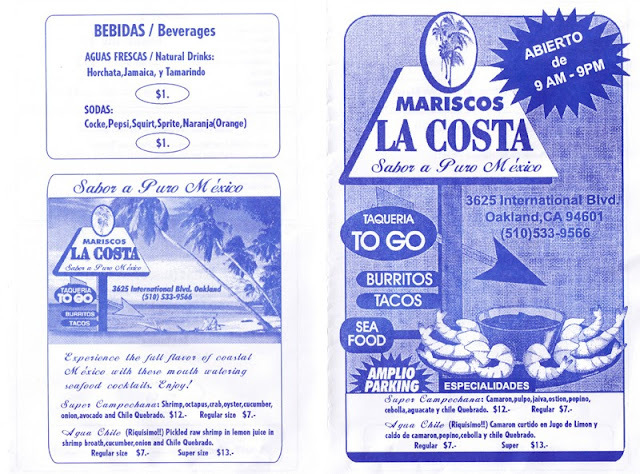 Two weeks ago I found this place called Mariscos La Costa in Oakland on International Blvd. I had dinner there with a friend a week ago. They sell oysters on half shell for $1 each! They are big oysters, too. I casually mentioned it to my Mexican friend at work. She was so surprised that I knew of the place. We ended up go there again today. Everything there is in Spanish. This one guy, a regular customer, told me that I was the first Asian he ever saw there. I had a ceviche tostada, too. The place is awesome although I was a bit in culture shock in that part of Oakland - it's like little Mexico. My friend, Rosa, who is from Mexico agrees. Driving down International Blvd during traffic hour isn't exactly a serene experience. It is a very busy street with people shouting, yelling, screaming at other drivers. People were driving and pulling over any way that was doable. Car stereos were booming with heavy bass. However, as soon as you arrive La Costa, you will suddenly be surrounded by palm tress. In addition to the palm trees next to the sign (first photo), there is an entire row of large palm trees next to the outdoor sitting area. You will start to wonder whether you are still in Oakland or somewhere next to the coast in Mexico. The setting of La Costa is different from most restaurants that I am familiar with. It only has outdoor sitting. It has a large parking lot, so you don't have to worry about finding parking on busy International Blvd. You walk up to the window to order your food. Their specialty is fresh seafood. You are not going to find any deep fried seafood there. I love oyster on half shell. Rosa loves mixta coctele (mixed cocktail) with shrimp, octopus, and oyster. Most patrons are Hispanics and the menu on the wall is all in Spanish. However, it's okay for you to order in English and ask questions. I am in love with Jamaica drink, which is hibiscus tea. I also love Horchata, but Jamaica is the drink of the month for me. 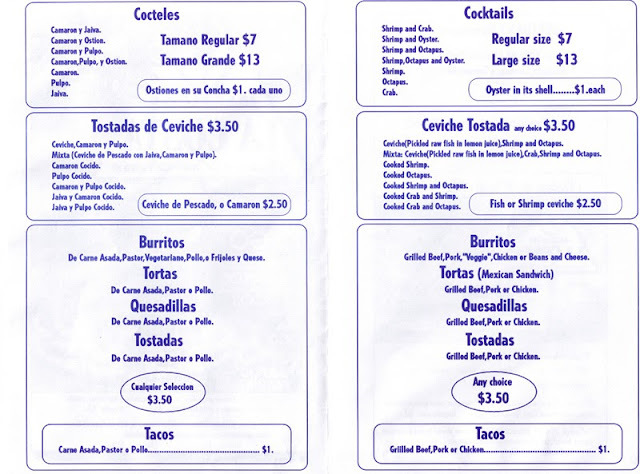 La Costa is located at 3625 International Blvd. (cross 37th) Oakland. I asked them for a takeout menu, and it is in both Spanish and English! The menu says they open until 9PM, but they closed at 7PM when I was there. If you are looking for fresh Mexican style seafood at low price, La Costa is the place to go. It's not a fancy place but the staff is friendly, helpful, and offers fast service. The customers are generally friendly, too. We gathered at Rockridge BART station this morning for carpooling. Master Ken was glad to see me with my car since they were short on cars. I picked up Christina and Silent Joe then headed toward Far West Fungi Farm in Moss Landing. The weather forecast said that there would be a shower in the afternoon; however, the rain started shortly after we got on the freeway. By the time I got to Highway 17, the rain was pouring down so hard as if someone was hosing down the car with full blast of water. I glanced back occasionally at Silent Joe who sat in the back. I hoped they weren't too worried. After all, I have driven Highway 17 countless times. We arrived at the Farm just minutes past noon, and we were the first group from Rockridge BART to arrive. We joined the first tour led John and Toby Garrone's (owners) younger son, Kyle. Unlike a regular vegetable farm, the mushrooms are grown inside of dark and humid warehouses on blocks inside of special plastic bags. These plastic bags cost 20 cents each, which allow oxygen to enter but not bacteria. Kyle Garrone explained to us how the sawdust is mixed, sterilized, and compressed. They are inoculated with mushroom spawns in "clean room", which the employees have to take a shower before entering and stay inside all day during the process in order to eliminate contamination. The clean room is the only facility that's not open for tour. The bagged blocks are then stored in the dark windowless warehouses. We got to walk through the warehouses of various mushrooms in various stages. Far West currently grow 9 kinds mushrooms - white, blue, brown, pink, gold, and trumpet oysters, shiitake, lion’s mane, maitake, and reishi along with acreage of traditional crop plants that their employees grow for their own use. They grow everything certified organic on recycled materials. At the end of the tour, we had our usual potluck BBQ. Now, you might wonder, how could we have a BBQ in this bad weather? First, a raining day is a great day for mushroom people. Mushroom people never cancel an event due to the rain. When it rains, we cheer in excitement. This was the second time I encountered wet weather on a Far West Fungi field trip during the last 5 years as a MSSF member. I always have rain gear in my car - two umbrellas and a rain poncho. During mushroom season, the rain boots stay in the car, too. Mushroom people and urban farmers are extremely versatile and creative. The Garrone brothers had setup the big grill on wheels at the entrance of a farm shed. If the rain got too hard, we would pull the grill inside a bit. We didn't have enough disposable plates and utensils this year, but that was no big deal. Many people did bring their own bowls as we always encourage people to reduce waste by not using disposable products. People used the lids of tupperwares, flatten cardboard boxes, plastic inserts of crackers, cups, etc. as their plates/bowls. It was interesting to see what people were using to carry their food. I always bring my own food tray and utensils in the car. Everybody enjoyed the feast and social gathering. In addition to the BBQ, we also raided the recycle pile of used mushroom blocks. The blocks are still full of mycilia and can be fruited again although it is not cost effective for the farm to reuse them. We took as many of the used blocks home as our cars could fit to grow mushrooms in our garages, closets, or under the trees. 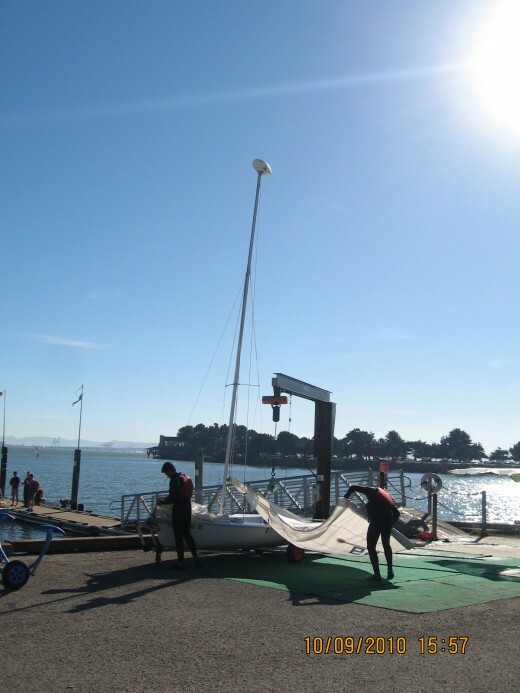 Berkeley Marina is located in Berkeley, California, off Interstate 80 at University Avenue exit. It's a great place to take a walk, bike, get something to eat, fly a kite, sail a boat, swim in the bay, walk the dog, have a picnic, hang out, or take a nap on a blanket. It's one of the popular hangouts for day activities. When you get off the freeway at University exit, you have the choices of heading down University Avenue to UC Berkeley or the opposite direction to the Marina. 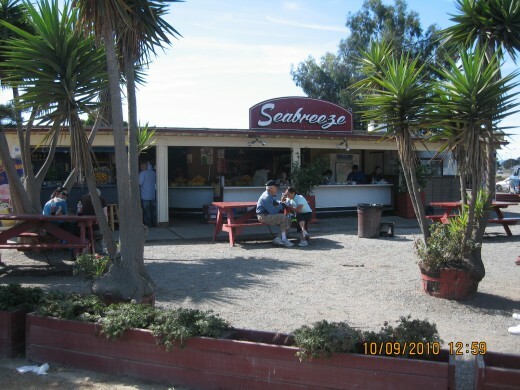 Sea Breeze Market and Deli is located at the entrance of the Marina. It has ample parking right next to it. Sea Breeze has been there for as long as I can remember. It sells fresh fruits, fruit smoothies, and various seafood sandwiches. As you walk or drive further down University Ave toward the Marina, there are a couple more fancier waterfront restaurants such the Hs Lordships and Skates. There are always people in the Marina walking or biking along the bay trail. There is an off-leash dog area in César Chávez Park. On any clear day, people are there to fly kites. The annual Berkeley Kite festival takes place in César Chávez Park. OCSC Sailing School is located in the Maria, where you can learn to sail and get certified. Berkeley Charter Boats can take you out on a fishing trip. Doubletree Hotel is in the Marina for visitors who want to stay right next to the bay. The July 4th fireworks celebration is held at Marina annually; however, the city is considering to change the location due to the impact of loud noises on both domestic animals and wildlife. 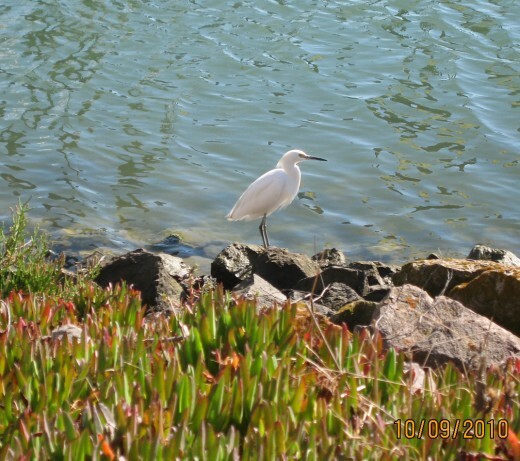 Berkeley Marina is a great place to spend a day doing anything outdoorsy. People are friendly, and there is something to do there for everyone including the dogs. It's the second day of another heatwave. I put Dusty in his cage before I left for the cubicle job this morning. As soon as I got back, I started to water the plants. Suddenly I noticed two golden eyes staring at me. "Oh, hey Kitty," I greeted the tuxedo cat resting in the shade. He got up and started walking toward me. Occasionally a cat wanders through the farm, but they never stayed long. I have never seen this cat before. I petted the cat and noticed how skinny he is. My policy is that everybody gets fed when they come to the farm. I don't have any cat food, not even a can of tuna; however, I do have some whole milk in the fridge. I knew he would like something cold to drink on this hot day. I went back inside to get the milk and Dusty's water bowl. The cat sure wasn't shy about getting a free drink. As he drank the milk, I went to pick more figs. A lot of figs ripened from the heat today. I picked another full basket. Occasionally I turned around to look at the cat. He just stood there starting at my direction. I wondered if he was going to stay. After I picked all the figs, I proceeded to water more plants. The cat wasn't standing there anymore. Maybe he left. Oh, wait, he went back to the same spot where he was resting before. After I watered all the herbs and vegetables, I checked on the cat again. He had curled up to take a nap. I left the rest of milk out for him and got another dog bowl out for Dusty's water. I have been picking a few figs before and after work. Every day I see broken fig bits on the ground and partially eaten figs on the tree. I see the squirrels running back and forth the fence and jumping into the tree every day. Today is Indigenous People's Day in Berkeley Area while the rest of the country is Columbus Day. I didn't need to go to the cubicle job, so I grabbed the basket and finally got a chance to pick all the ripe and mostly ripe figs. If you are familiar with figs, you know they don't stay fresh too long. I like to preserve some for later. I rinsed the figs first just because they have been sitting out there in the dust and who knows how many squirrels have climbed over them. After the were rinsed, I cut each in half and placed them on a cooling rack. Just my luck that we are having another heatwave here in the Bay Area. My sun room was over 90 degrees, so I left the sheet of fig halves in there until the sun started to set. In the evening I transferred the figs into the dehydrator and set it at 140 degrees for drying vegetables and fruits. Within an hour, the aroma of figs filled the kitchen. I wish I could bottle this awesome aroma. Some of the figs are much bigger than the other. The bigger ones will take longer to dry. It will most likely take a couple nights for all of them to dry. They will reduce in size greatly when they are done. I will then bag them in zip lock bags just like I did with the dried apple slices. If you don't have a dehydrator or sun room, you can dry figs in your oven. Set the oven to the lowest setting possible and keep the door ajar with a metal spoon or something heat tolerant. I did this last year before getting a dehydrator. If you are looking for a dehydrator, check craigslist.com first. Sometimes people give them away under "free" section. You can also get them under "appliances" or "household" of "For Sale" section. I got mine off craigslist for a fraction of retail price. Prior to my New York trip, I received a card in the mail about compost giveaway on October 10, 9 am - 5 pm, at El Cerrito Recycling Center, 7501 Schmidt Lane. I immediately marked the date on my schedule. Today is the day, and before 9 am I have loaded my Cruiser with 3 five-gallon buckets. Shortly after 9 am, I was on my way to the recycling center. This would be my first time going to the recycling center. I thought I knew where it was, but I ended up at the Electronics Waste Recycling event at the DMV parking lot. I got out of there and drove up Schmidt Lane. It turned out that the recycling center is located further up the hill. I was happy to see that people have already lined up for free compost. After a short wait, I entered the compost area with a few other people. I was so happy to see the quality of the compost, which I nicknamed "black gold." The smell of the compost pile was earthy and organic. Love it! El Cerrito has just started collecting food scraps in July this year. Personally I do not have a whole lot of food scraps to put in the recycling bin since most of them go into my own worm compost bins. I have to feed those pet worms! While I was getting my free compost, I also received some information on upcoming community workshops on Climate Action in El Cerrito. They will be held at the city hall on October 26, 5-7 pm, and December 2, 7-9 pm.